We are pleased to announce that the Leicestershire Archaeological & Historical Society will be sponsoring a reception for delegates at the Jewry Wall Museum as part of TRAC 2015. The reception will follow the plenary lecture on Friday 27 March, which will be delivered by Dr Andrew Gardner, Senior Lecturer in the Archaeology of the Roman Empire, at the Institute of Archaeology, University College London. 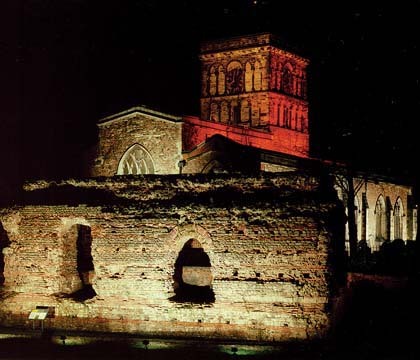 The Jewry Wall Museum houses Leicester’s outstanding collection of Roman artefacts, including spectacular wall paintings that are amongst the best preserved from Britain. It was purpose built after the pioneering excavations by Dame Kathleen Kenyon on the site of the city’s Roman baths. The Jewry Wall itself, stands 30ft high and would originally have formed the west wall of the palaestra adjoining the baths. The Leicestershire Archaeological & Historical Society is the county’s premier historical organisation, having been founded in 1855. It aims to promote the study of the history, archaeology, antiquities and architecture of Leicestershire. The Society publishes, funds and encourages research on all aspects of the county’s diverse heritage. It also hosts a well attended programme of lectures by visiting speakers, including the annual W. A. North Memorial Lecture which covers a topic related to the Roman Republic or Empire.